Note: This post is extremely long, we're going to talk about the events that most marked us as creators and how they changed the project as a whole. This is somewhat personal, we don't go into detail about everything, but if this isn't what you're looking for from us, feel free to skip this post. TIWOD has been in development for a while now, at the beginning we had trouble with design decisions and structuring the game, but now we finally kicked the entire project into pre-production and everything is going according to plan. 2018 was a landmark not only for the project but for our small 2 man team. The overwhelmingly positive feedback is hard to describe into words, just know that every single message, video, post, comment or criticism was taken in consideration by us, we're working on a passion project, we want to get this right, and so far, I think we're on the right track. The project was completely different last January, as it had been an idea since November 2017 where nothing was really accomplished until a later point in 2018. Back then, the game was called "Shine" as it was what made the most sense at the time as the story, mechanics and overall feel of the game were quite different. The main mechanic of the game was to use Shiny, the plushie dino that the player walks around with, to find hidden objects in the scenes and solve puzzles, at the time the game had enemies but nothing like it has today. 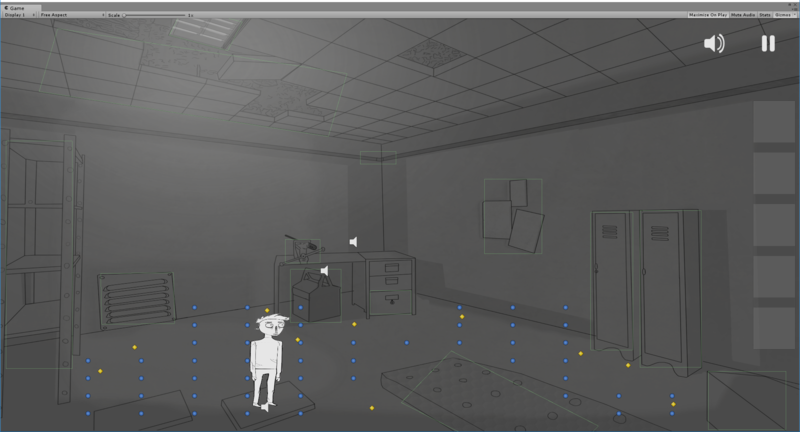 This is a screenshot of the first prototype in Unity we created. This prototype had the base for the game, movement, interactions, all that good stuff, it was missing something though. It was missing the most important part of any game, the emotion. You know how you as a player get motivated to do specific things because you decide to immerse yourself in the narrative and the world? That's what was missing at this point, we had mechanics, but we didn't have a world, or well-written characters. Something needed to change, so we spent the next few months, working on something different, we decided to take the game in a more surreal aspect and use my weird art style to the project's advantage. We accomplished this by exploring worlds that used surrealism to create memorable characters and stories. 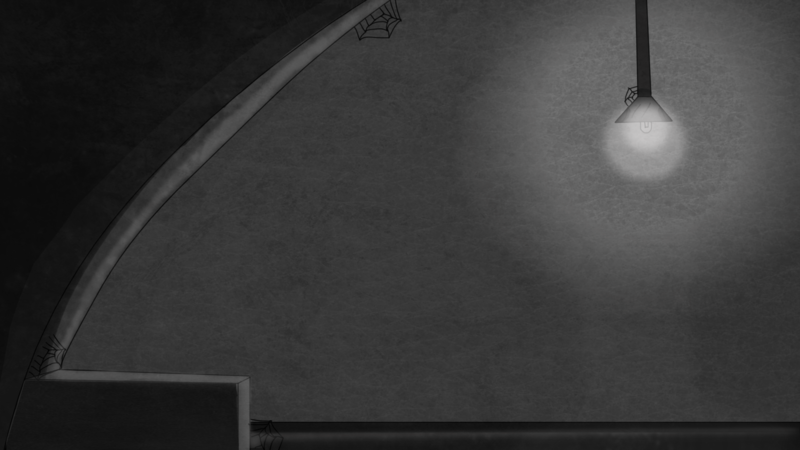 Games like "The Cat Lady", "Fran Bow", "I Have No Mouth And I Must Scream", "Neverending Nightmares" and "Sanitarium" were all huge inspirations for this project, all in different ways. Ones stuck out for their narrative, others for their style and others for just how well done they were. This is because all of these games had emotion behind them, and that's exactly our next step at this point, grab all the characters we have, write a good story about them first and foremost, and use the famous "show, don't tell" when it comes to world building. 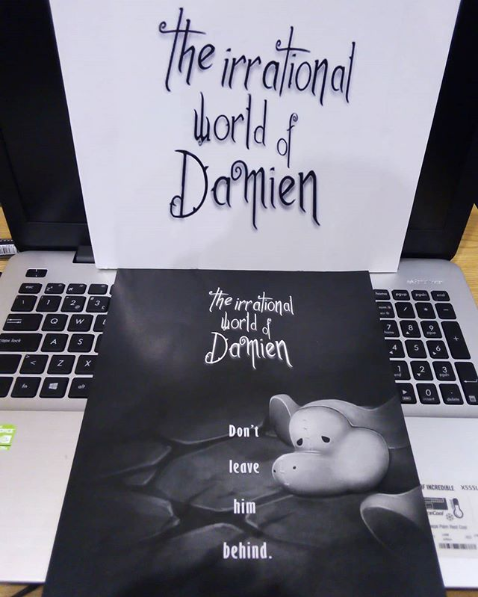 So, Damien was born around this point, our bug-eyed protagonist whose mother went missing and he decides to look for her with his best friend, the previously mentioned plushie that glows in the dark. All of the sudden, we had our hook, this was around March. So now we needed something playable to show in June as we're all in college and at the end of the year, we had to present a playable project for a variety of people who all work in the game dev industry. Planning ensued, and we decided to start what would later become the demo attached to this post, but a lot more empty. This is what the first room looked like back in April, it was playable, but not much to explore or do. We at the time had all the basics for the game, we had an inventory at the top of the screen, we had icons for interactions and a makeshift menu screen, in just 2 months with classes, daily train commutes and life getting in the way, we were proud of having a demo with a beginning, middle and end to show at the end of June. The presentation that changed it all..
Now this presentation we had in June did not go well, I would be lying if I told you it did. There were a multitude of problems happening that caused our project to be outright ignored. I won't go into detail about the problems in this post, as it concerns people outside of our team and only those involved can comment about it, but just to drive home the point I'm trying to make, our little stand didn't get any attention, we had a total of 14 people play the demo. This wouldn't be so bad if there weren't 40 people invited to check out the projects on display. Anyways, that day went by, and with good reason me and Rob, the other 50% of RP Studios, were extremely unmotivated, we were aware of the fact that we had an actual demo ready to be played and critiqued, and it was the lack of feedback that made us start thinking a lot. "Where did we go wrong? ", "What could we have done differently? ", "What is missing here?" We were somewhat lost, we were expecting all these industry professionals to talk to us about what we were doing right and what we were doing wrong, but it just didn't happen, and whenever a team has something big happening and that something doesn't happen, it's normal to lose track of what your plans were. So we did what we thought was correct, we took a break. After the nightmare that was the 21st of June, we decided to just enjoy summer, I can only talk about myself personally here, as Rob and I kept contact but since we live far off from each other, we didn't meet often. I had something click in my brain, and decided to do stuff I never did before in my life, I went camping to a festival called "Paredes de Coura" which is an indie rock-centric event, at least I think it is. I spent a lot more time out of the house, I went for walks, I went out with friends and did what I could to just get my mind of the project for a while, I was effective, completely burned out. 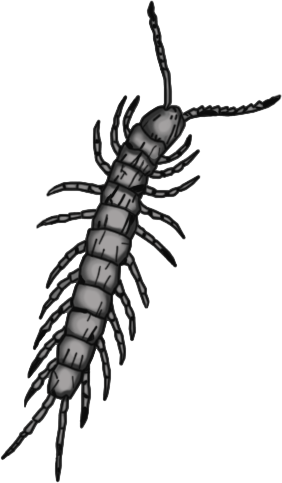 felt like a centipede, small and helpless. Around the beginning of September, a friend of mine invited me to go spend a few days with him at his college house in Coimbra, since I only started classes in October, I was fair game, and I went. What started as a 3-day plan, turned into 4, then into 5, then 6. Those 6 days were very eye-opening in a lot of aspects, I never lived alone with roommates, for school I travel close to 4 hours a day by train, 2 hours to go from my house to Lisbon, and 2 hours to come back. I'm used to it. So having "roommates" for 6 days changed my perspective on stuff, and since they were all creative people, the talk about me working on games obviously came up, and I explained quickly my progress up until now. They were completely stunned, they had all these positive comments right then and there about how I function, the project and my ambitions, they all played the demo that was largely ignored in June and they loved it, and everyone had something to say about it, positive or negative, and it was just fantastic to see something you worked on not be ignored. I, of course, took a look at what everyone was doing and gave my input as well. I then returned home, and my mind was set. This project needs to happen. What followed were a lot of plans, writing, and self-improvements. I wrote the entire storyline for the game throughout September and October, and everything started falling into place. Then the highlights started happening..
October, 2nd year of college begins. Now I'm lucky enough to be studying what I love, and I'm not against anyone I talk about in this post, but with the start of the 2nd year came a lot of storms and dark nights. Our class had issues with a teacher throughout the first year, but didn't really spoke about it because well, why would we? We already paid for the course right? Things escalated though, October was when I and my classmates started to become a lot closer, we started being more open to each other, and shared a lot of experiences. 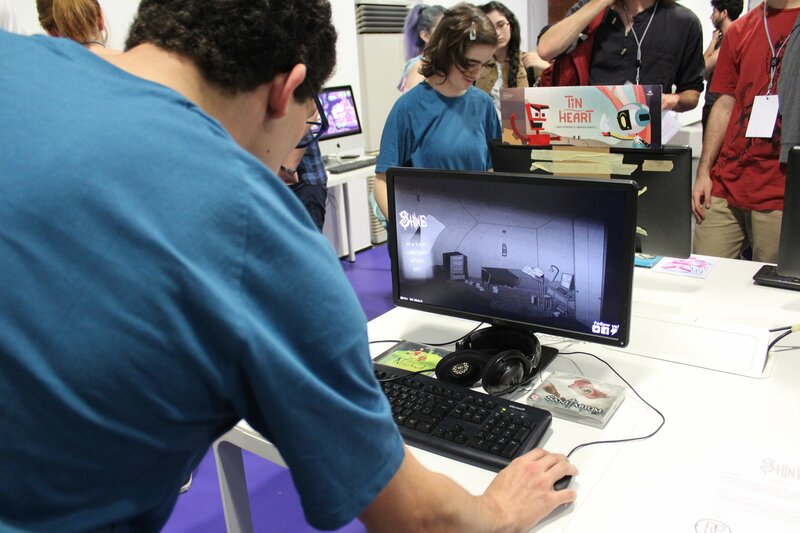 Around this time Lisbon Games Week 2018 was accepting projects, and I've been a part of them back in 2016 when I had my own stand with my first commercial project. Rob and I were working on a polished demo for LGW, and praying that we would get accepted. This is when the game changed, it got a new name that better represented what our vision for the game was, it had new mechanics, an actual world, and best of all, it had emotion. I was happy with what we had in store for LGW, if we were accepted that is. At 3:52 is when it shows up. Alongside 54 other projects, there it was. I, of course, had already received confirmation that the project was accepted but, this moment, was just surreal to me. I felt like I had a decent shot of showing people what I was working on, and I wanted to bring my A-game to this. I got a friend to make me a decent poster, (shoutout to Aquiles for this), I got another friend to offer me a place to stay since I again, live 2 hours away, (shout out to Carlos and his mom). Some of the goodies at our booth. 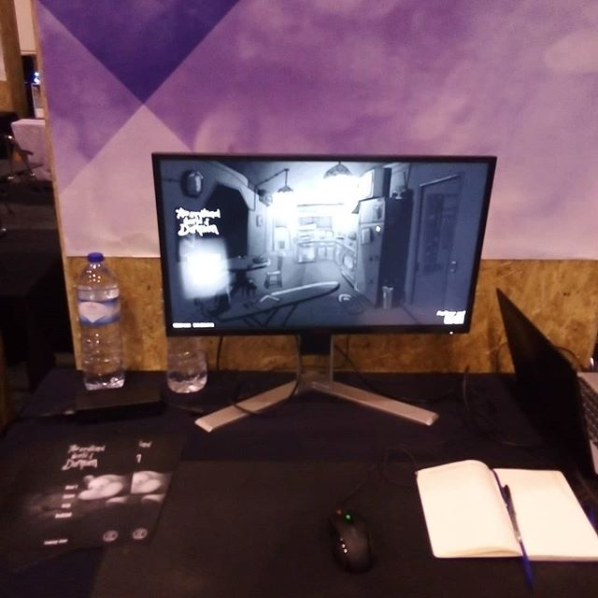 This is our booth, we had a notebook for emails for our upcoming newsletter, a lot of water, posters and I even brought my old laptop to serve as a second screen, so people walking by could look at the game. We had a plan, I would walk back and forth with a poster getting people to play the game, Rob would stay at the stand and explain things in more detail and for the 3rd and 4th day Carlos (the one that got me a place to stay) was helping out as well. Day 2 went better, and that's when the folks behind IndieX told us that even though they were a bit late, that the public voting has begun. So I was like, "ok, well, let's be extra annoying then". That's exactly what I did, the voting worked like this, you had a small sheet of paper where you'd put your email, name and the game you wanted your vote to go to, then you'd drop it in a black box filled with votes. I grabbed a handful of those paper sheets (with permission of course) and I placed them in our booth, whenever someone finished the demo, they 90% of the time would immediately vote for the game. 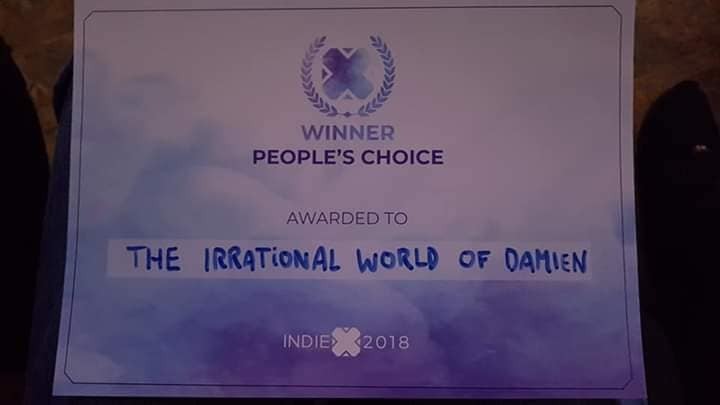 I took this one step further, alongside IndieX, where our project was, the Playstation Talents were next to our booth, and they for the most couldn't participate in the IndieX awards, so I asked everyone to vote on the game too. 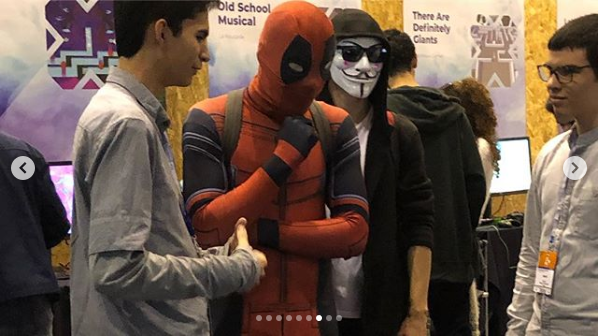 We even got a Deadpool vote for the game! Day 4 of the convention, my parents came to visit, and at around 5pm, the staff was gathering everyone to go to the stage area to give out the awards. The stage wasn't too big, but it was big enough to have everyone interested in game development there, professionals, teachers, and especially my parents were all there. I was actually super curious to see who'd win what category because in my head I already had a winner for each one. Everything started out normally, and a streamer called Halimede (although I had no clue she was a streamer at the time) walked up on stage to give the first award, People's Choice. Now, you might not understand anything of what was said but know this. As soon as she said the name of the game, I went blank. I have no clue what I said, I don't remember being on stage, I was on auto-pilot. I remember sitting down with the award in my hands and still didn't believe what was happening. I won an award, after a published project on steam that didn't get much attention, after starting college, after so many life hardships, after various unmotivating events, after having teachers that said I wouldn't go anywhere, this changed everything. The spark was back. RP Studios was back. I was back. What are our plans now? After the convention, we kept working on the game and then took 2 weeks off for holidays and whatnot. 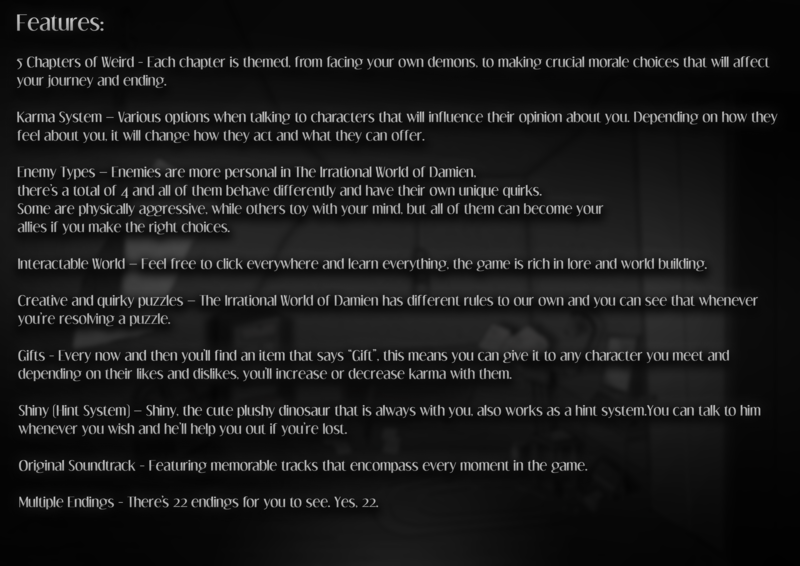 Chapter 1 will be finished until the end of February, we already have every scene planned, the puzzles and now all that's left is make all the parts and make everything click. We're currently talking to a few publishers in order to get some help with this project, as we want to bring this in front of as many people as possible. We're also going to try and go to all game-centric conventions and events in Portugal, we can't go to others outside of the country since we lack the funds to do so. Until the end of 2019, we will have the entire game structured and planned, and almost all 5 chapters completed, we will probably need help a bit further on, but we'll see what happens. Blog posts will keep showing up every week or so, as we like to be transparent with what we're doing, we're not a huge company looking at stocks, we're a 2 man team that is working out of love, if something comes out of this, then that's even better, so we're doing things our way. 2018 was a rollercoaster of a year, so much happened, I feel like I changed as a person for the better, and that now I have everything set in motion to create something unique. I learned to ignore the haters basically, as a lot of them tried befriending me after we won the award, not happening. To those reading this, thank you. I've never written anything like this before, and it will be a while before I do again, so if you read everything, thanks. Here's to a kickass 2019. Next blog post will be at the end of the month, but we'll be putting updates on our social media, so keep an eye out. The demo that was available at Lisboa Games Week 2018, with a few updates.